The in-package King Composer page builder makes your site building process incredibly easy. You can save more time building your site. Not to mention the different design layouts that are available, you can choose the one that suits you the most and get a headstart building your website. 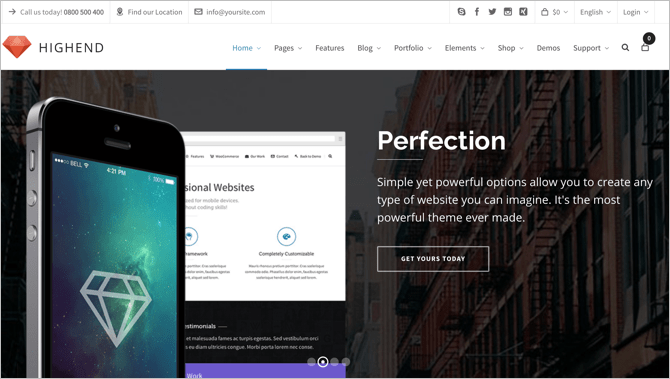 Ultra is a multipurpose theme that is created by the team at Themify.me. 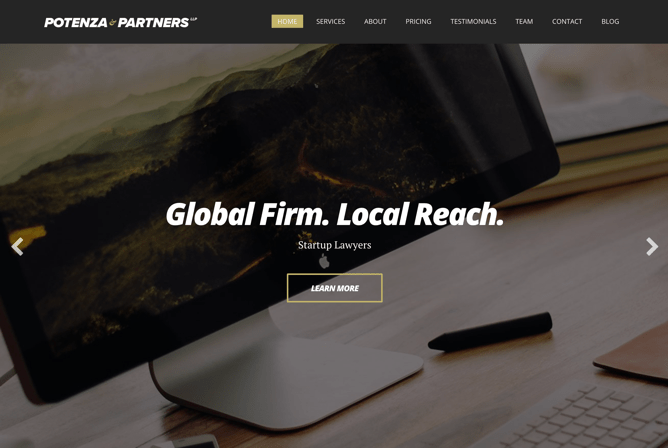 There are multiple demo sites for different businesses such as an agency, a restaurant, a spa, a law firm, an accountant, a portfolio, and much more. You could also import these themes easily with just a few clicks. You also have access to 60+ pre-designed layouts to edit the demos and to customize as you want. You can even create your own theme from the ground up with ease. 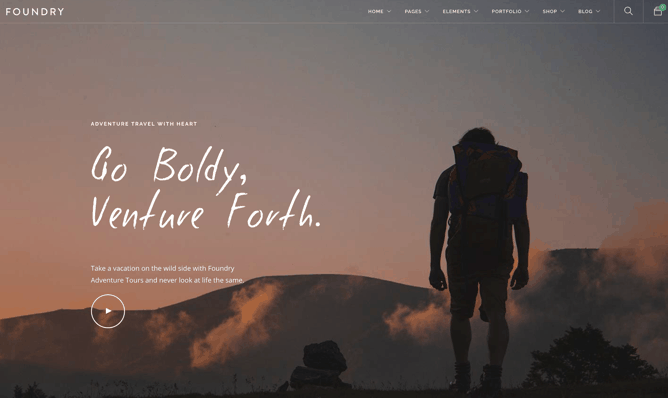 Foundry is a multipurpose theme that is rated highly on ThemeForest. It has a rating of 4.89, and has more than 4K sales. They are known for their high-quality, 5-star support team. They have 2 hours of video tutorials to help you get started and customize your theme as you want. You can easily install any of the homepages available with just 1-click, and it will be running on your site within seconds. Not to mention the 13 blog layouts and the 17 portfolio layouts to help you customize the site according to your needs. 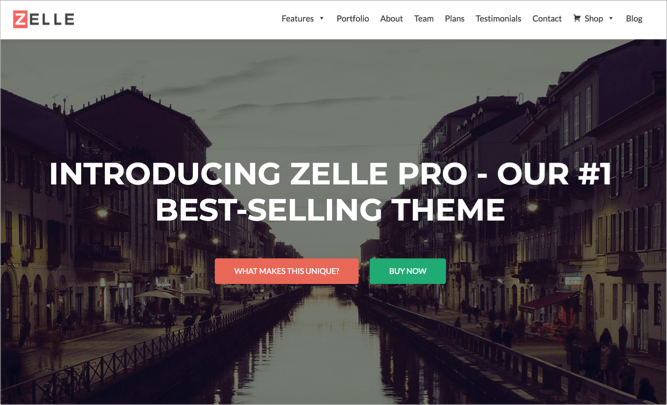 Zelle Pro is a premium theme from the team at ThemeIsle. 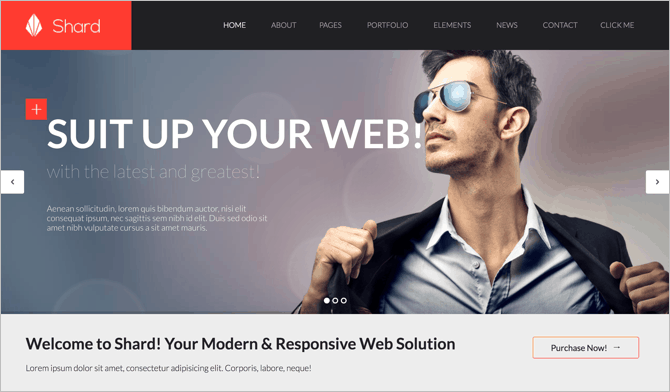 It is an elegant theme with a one-page layout and flexible interface. It is compatible with many of the drag-and-drop page builders such as Elementor. This gives you the ability to customize the theme as you want or need. It also integrates with WooCommerce, so you can create your online store and sell your products or services. Kallyas is a powerful eCommerce theme that was featured on the ThemeForest blog. It has a whopping 38K+ happy customers and a rating of 4.7 out of 5. With over 65+ demos that you could import with the click of a button, and the live drag-and-drop page builder that enables you to see all the changes as you make it, you will be able to customize the theme to suit your needs in no time at all. You will also get access to many of the features you need as an ecommerce store with the WooCommerce integration, pricing table setup, extensive documentation to not sink in the code, maintenance mode, Revolution slider, PHP Contact form and much more. Plus, the PSD files are included in the package. Not to mention their fast response time and ready-to-help at anytime support team. 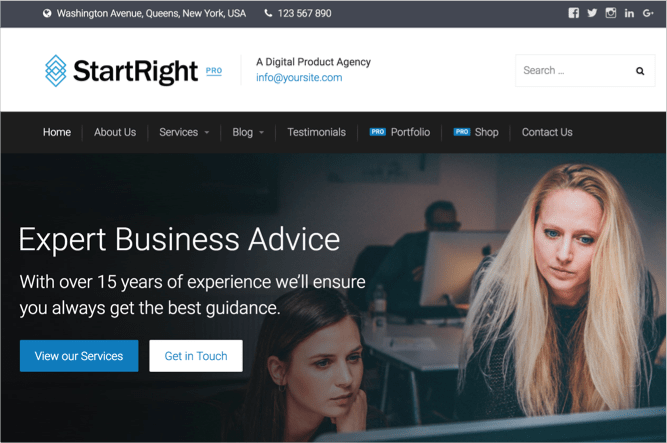 StartRight Pro is the flagship WordPress theme from the team at Create & Code. It is a beautiful and clean theme that looks professional. This means that it will suit your small business perfectly. You can easily import any of the demos available to get started. It also integrates with WooCommerce, which provides you with the ability to sell your products online. 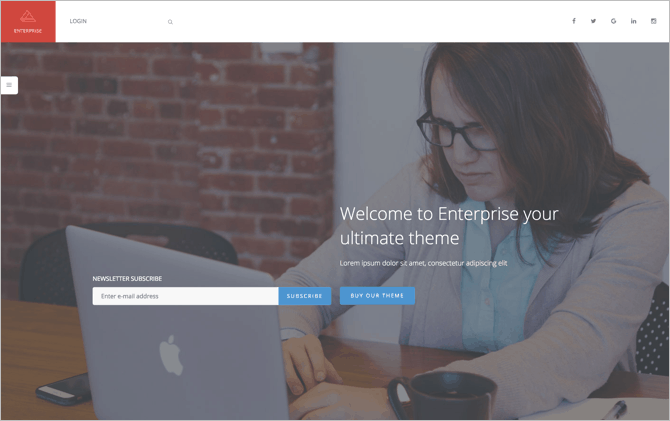 You also get access to the amazing Elementor page builder that provides you with a lot of customization options to edit your theme or page as you want. 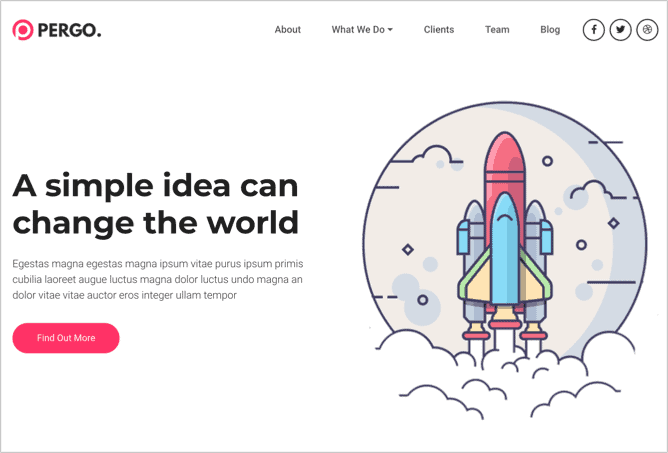 Ayro is a theme that is created specifically for tech startups and digital businesses. It has a rating of 4.5 on ThemeForest. There are 12 different homepages to choose from that you could easily import with just one-click. You get access to the drag-and-drop page builder, so you can customize your page as you want. It also integrates easily with WooCommerce to help you sell your products online. Rocked Pro is a freemium theme from the team at aThemes. There is a free version that you could get and try to see if it suits your needs. 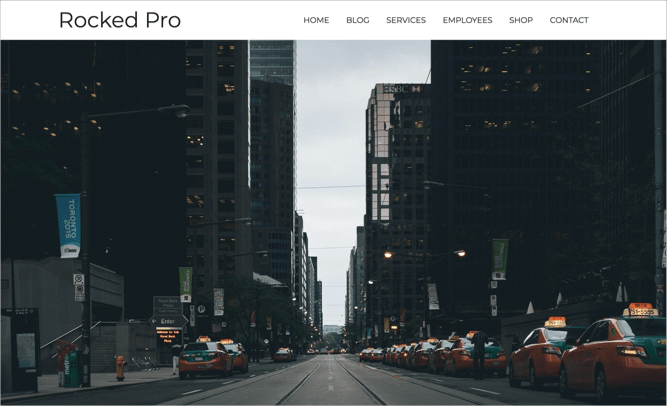 However, their pro features are really awesome, so you need to check out this theme. You get access to the Crelly Slider that you could use in the header to create slides of your different products or testimonials of people who use your products. You also get access to seven page templates to help you create the page you want with no fuss. Not to mention the extra widgets you get access to to customize your page such as the timeline widget, and so on. You also get integration for the WooCommerce Plugin to create your own store and sell your own products. Atom Lab is perhaps the ultimate multipurpose theme that was created with startups in mind. By ultimate, I mean you get access to more than 24 beautiful homepages that you can choose from. There’s also 61 inner pages to create the inner pages of your blog in no time. Then there’s 14 portfolio layouts so you can choose the one that suits you site, so you can display your work to your clients and customers and seal the deal. You also get access to WooCommerce integration, the visual drag and drop page builder, and the amazing slider with the theme. Potenza is a theme that was created by the team at CSS Igniter. 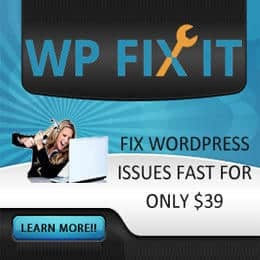 It is a robust single-page WordPress theme with flexible layout options to choose from. You also get endless design options such as custom background, parallax modules animations, and much more. Not to mention the drag & drop homepage option that you can edit using their custom content widgets. 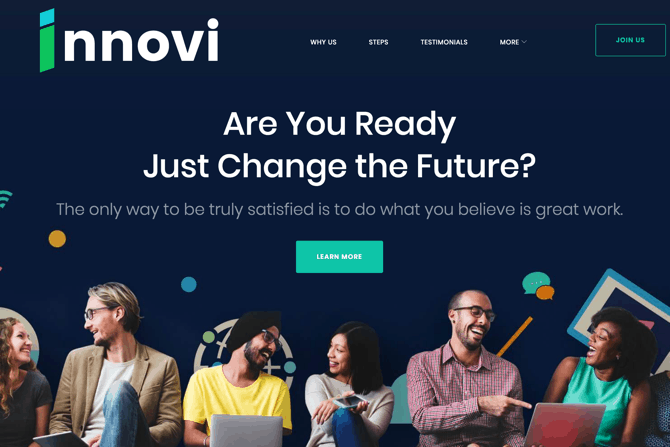 It also totally integrates with many of the page builders available in the market such as Elementor, Divi, and Gutenberg. You can also import the demo with just one click. You also get access to their team which provides premium support and guarantees response in less than 24 hours. They have been doing it since 2012, so don’t worry about not getting a response from them when you reach out. Stack is a multipurpose WordPress theme that has been featured on the ThemeForest blog. You can easily one-click import any of the demos available to get a head start. They have many unique demos to choose from, more tha 150 content layouts, so you can edit your theme as you want. You also get access to the amazing Variant Page builder that is available exclusively on WordPress for this theme. 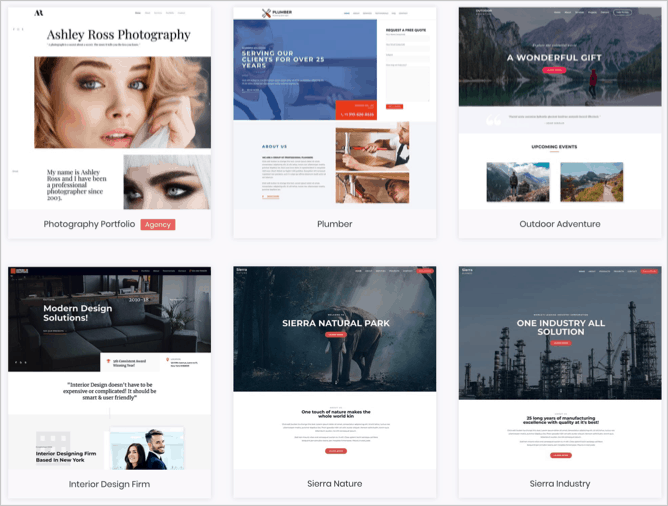 You also get access to the usual visual composer drag-and-drop page builder, the slider revolution to create your own beautiful slides, and much more. It integrates with WooCommerce, Contact Form 7 to create your contact forms and much more. 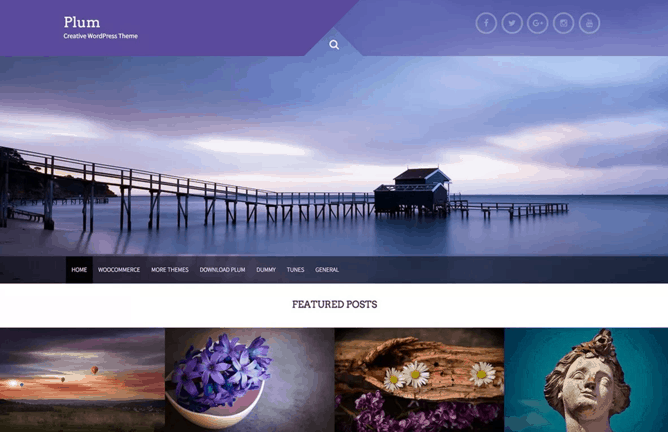 Presence is a multipurpose theme that is available from the team at WP Zoom. It is their most flexible theme as of now. 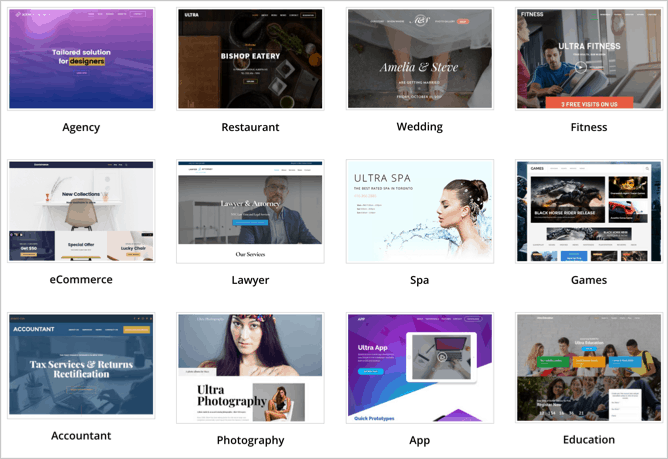 You get access to 10 demos for use in building different business websites like real estate, hotel, university, agency, portfolio, fitness, magazine, WooCommerce shop and much more. You could easily import the theme with just 1 click. You also get access to their drag-and-drop page builder, so you can easily design your page to look as you want. 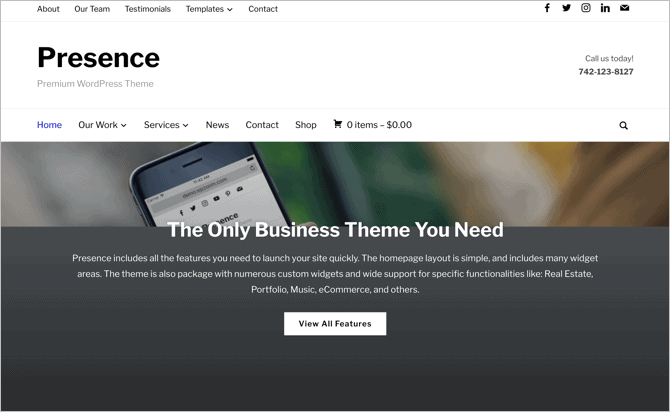 Highend is a multipurpose theme that is available at the Mojo Marketplace. 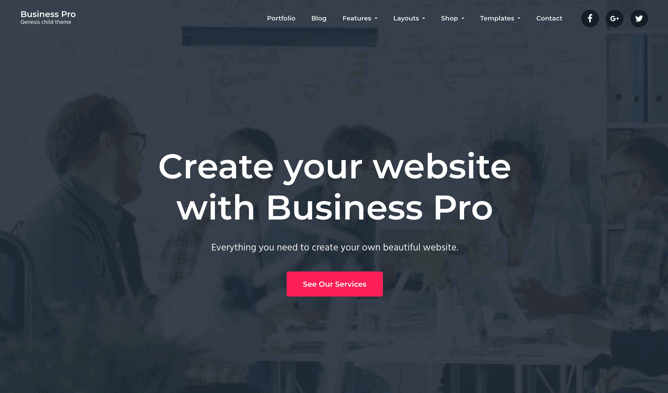 It comes with a beautiful drag-and-drop page builder to help you design your good looking page in no time. 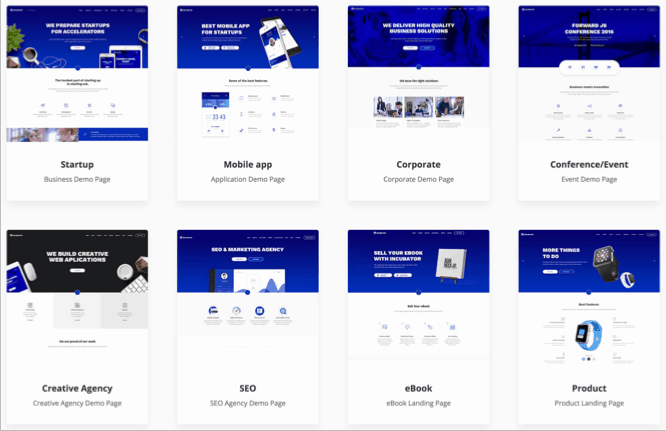 You also get access to 16 ready-to-use templates that’s created for multiple businesses in mind, so you could get a head start designing your site to look as you want. You also get access to the slider revolution and the layer slider 5 to create beautiful sliders for your site. You also get access to their WooCommerce integration to create your shop and sell your products. 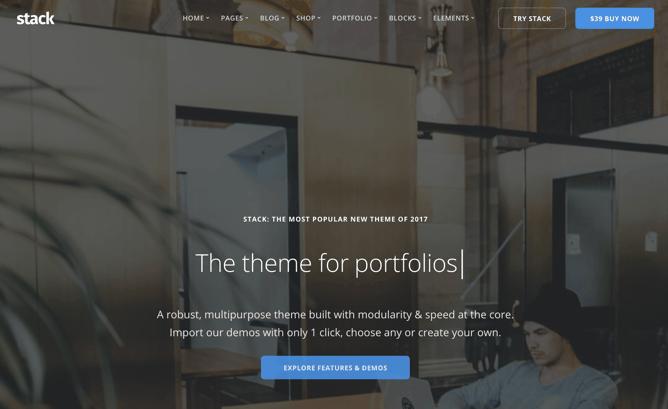 Struct is a clean WordPress theme created specifically for SaaS, startups and software businesses by the team at CSS Igniter. You can easily edit the homepage by dragging and dropping elements using Struct’s flexible content widgets with no coding experience needed. You also get access to 13 custom widgets that you can add as contact maps, scheduling and more. 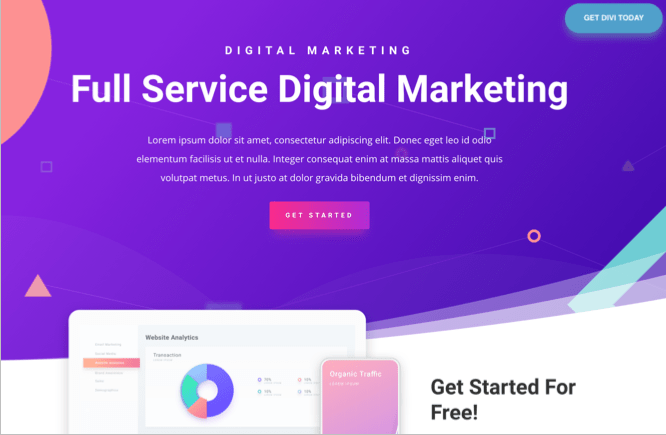 You also get access to 5 custom content types (services, projects, team, FAQ, guides, and testimonials) which are needed by almost all businesses. 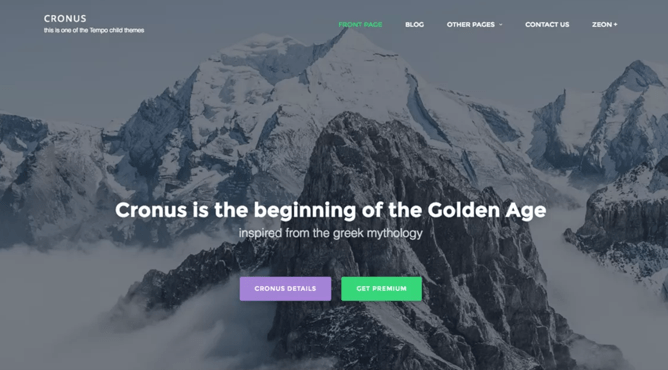 It also integrates with popular page builder like Elementor, Divi and Gutenberg (the new default WordPress editor in WordPress 5.0). 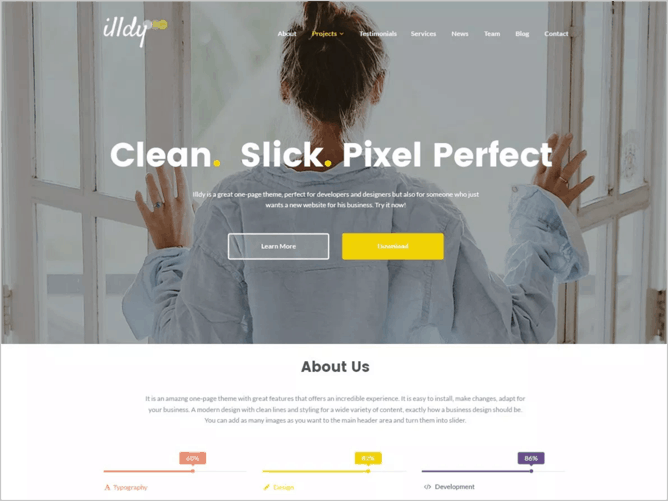 a clean WordPress theme specially designed for software, SaaS, apps builder startups. 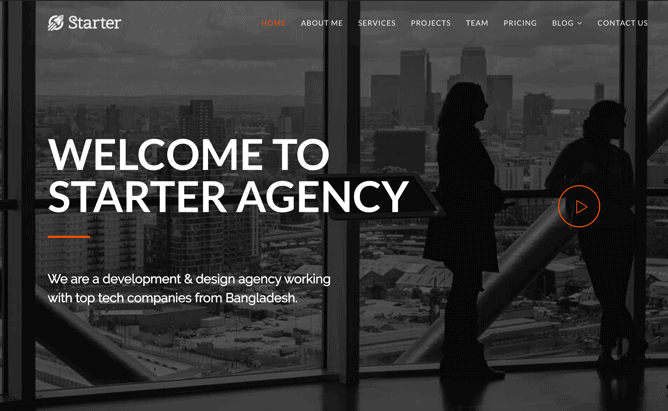 Startup Agency is a theme that is created for startups and creative digital agencies. It is available on Template Monster. It comes with the power builder, Template Monster’s drag and drop page builder, that helps you edit the homepage and other pages. You can easily customize it as you need. 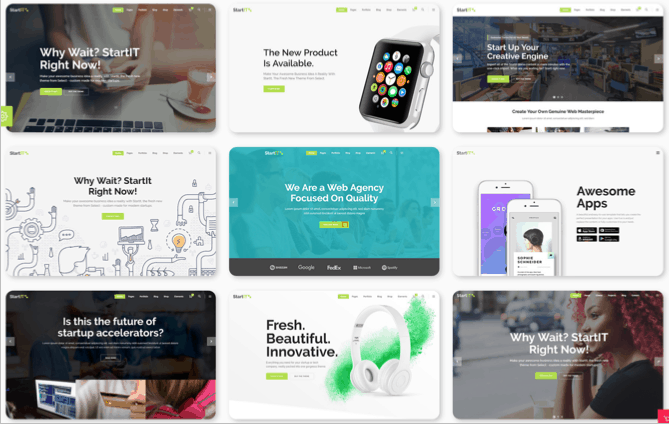 It comes with Cherry plugins to help you customize your site even more — plugins like the Cherry Testimonials, Cherry Team Members, Cherry Popups, Cherry projects, Cherry Services plugin, Cherry sidebars and much more. 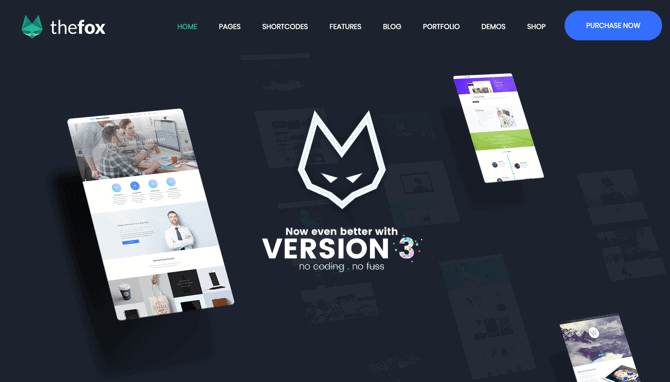 The Fox is a multipurpose theme with a rating of 4.7 on Theme Forest. 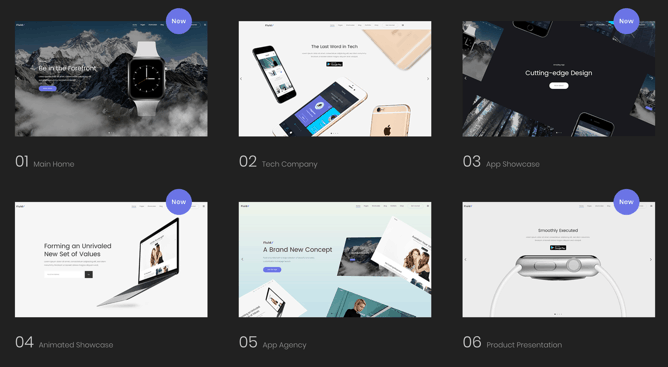 You get access to 30 beautifully designed homepages that you can choose from. You could easily import these with just one click. You also get access to the drag-and-drop page builder to customize your page as you want. Not to mention their fast and professional support team. 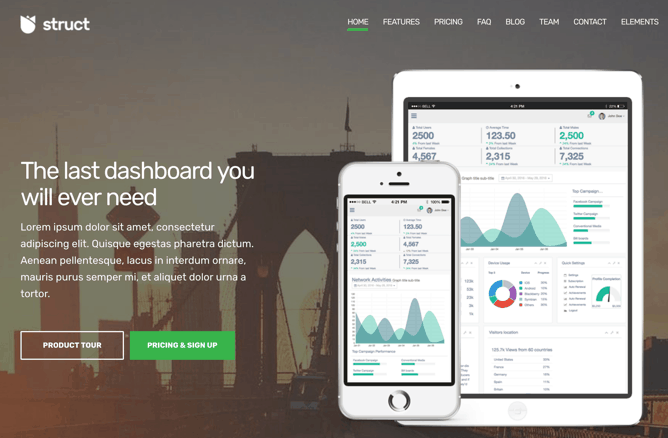 Shard is a multipurpose business WP Theme that you could get on ThemeForest. 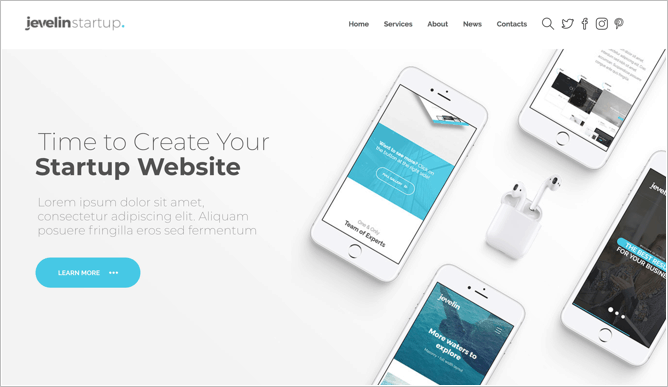 You could easily change the color of the theme, edit the header style and choose from 6 different styles available, add parallax and video background, and use the drag-and-drop page builder to edit your site with ease. You don’t need coding experience to do all these. You also get access to the Revolution slider to create your beautiful sliders. 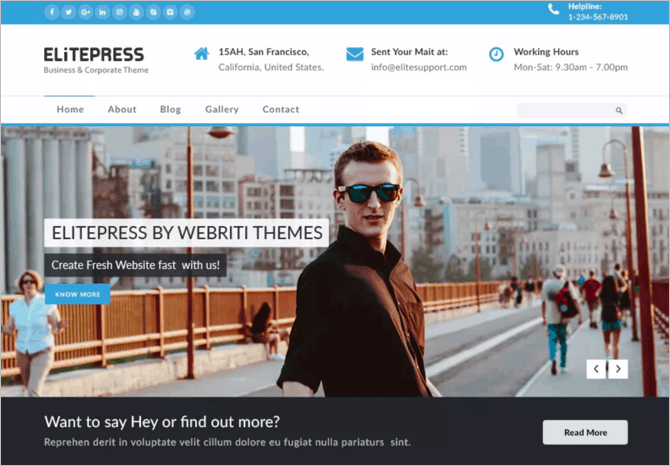 It is a beautiful and elegant theme that you need to check out. 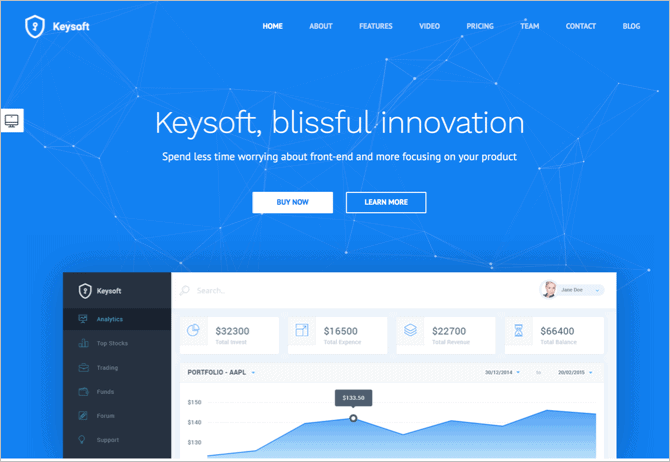 KeySoft is a WordPress software landing page that has a rating of 4.5 out of 5 on ThemeForest. 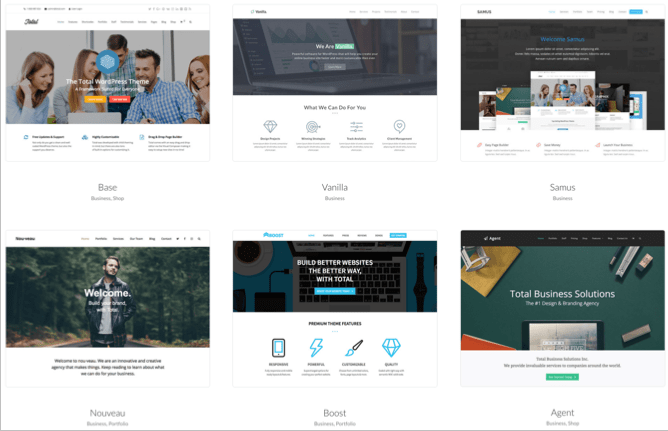 With 9 different header styles, and the drag-and-drop page builder with its custom elements, you can easily customize it as you want. You could also install any of the demos with one click. It is created for software businesses, and the team behind it nailed every piece of the page. StartApp is a multi-concept theme that has an amazing 4.83 out of 5 rating. 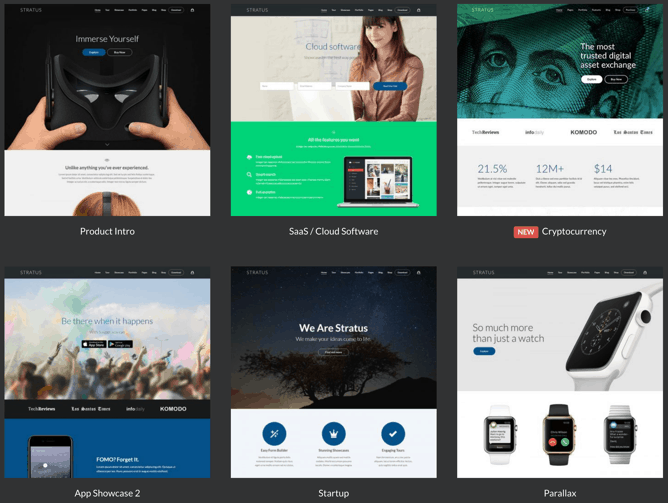 With 9 ready-to-use niche demos that you could import with 1-click and 45 short codes to style your theme as you want, plus the drag-and-drop page builder, you are in for a treat to make your site look as you want. You also get WooCommerce integration to easily sell your products and services. The PSD files are also included if you need to customize things on Photoshop. Fluid is a theme created for apps, startups and digital businesses to showcase every part of their digital business. You could easily import the demo site with one click. 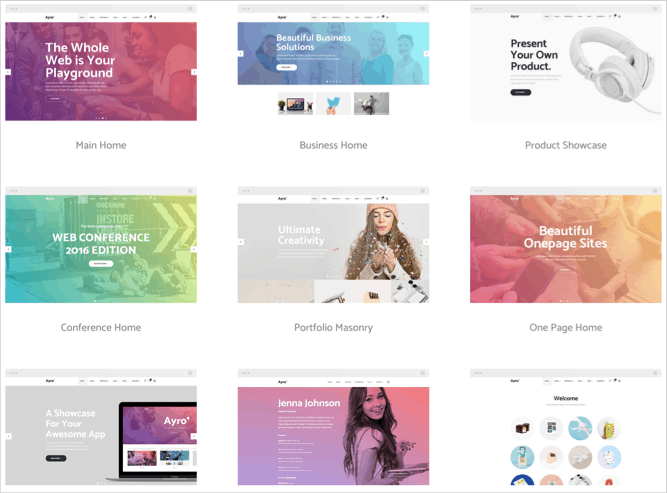 You also get access to the drag-and-drop page builder to easily customize your site, the slider revolution to create responsive slides, and many shortcuts to help you customize your theme. It is a simple and powerful theme at the same time. You definitely need to check it out. 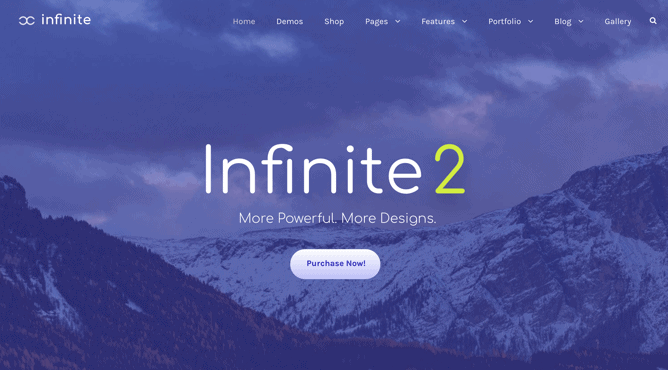 Infinite is a powerful multipurpose theme that has a rating of 4.8 and has over 6.9 K sales on ThemeForest. 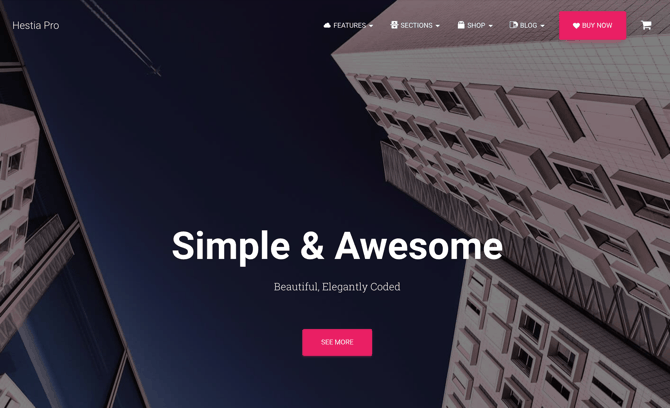 Infinite was created by GoodLayers, a power elite author on ThemeForest. You get access to 21 high quality demos for different categories such as corporate, creative, WooCommerce and niche. You could then install the demo with just 1 click. You also get access to their unique, ultimate drag-and-drop content builder. 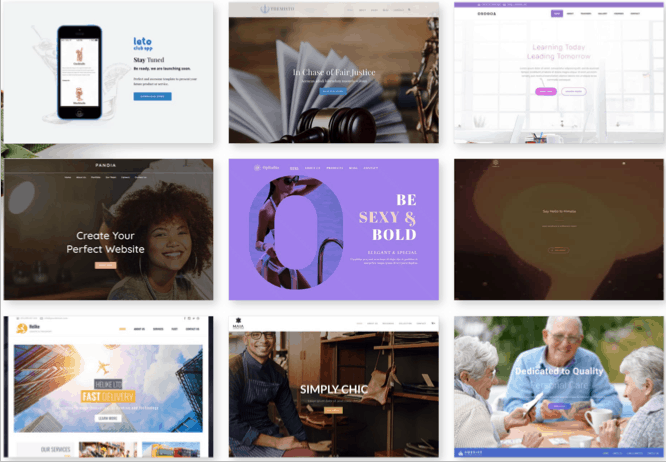 You could use the live customizer to edit your page live, turn your site into maintenance or coming soon mode, use your own fonts, and use any of the 14 blog layouts, 9 portfolio layouts, 19 header layouts and 6 gallery layouts. 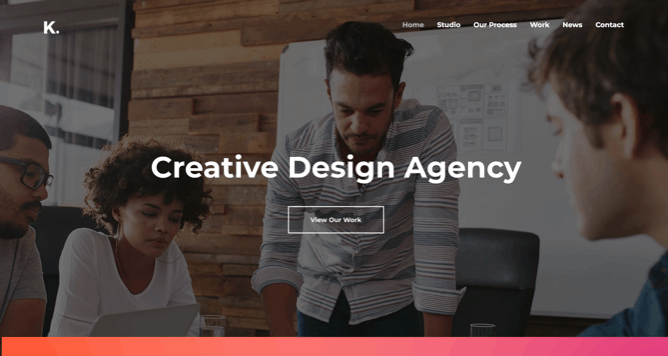 From an eye-catching 30+ Demo pages to a client-centered lead magnet forms, it covers all the required features a startup theme must have. With cross-browser compatibility and detailed documentation, you will need minimum technical knowledge to install the theme. The powerful shortcodes and 24 X 7 customer support make this theme a must watch. If you are starting a startup, then you already have a lot of things on your plate. Spending so much valuable time in choosing a theme from the hundreds of available sources would be the one you want to avoid at all costs. You are better off investing your valuable time on something else. After all, not all the themes are suited for startups. 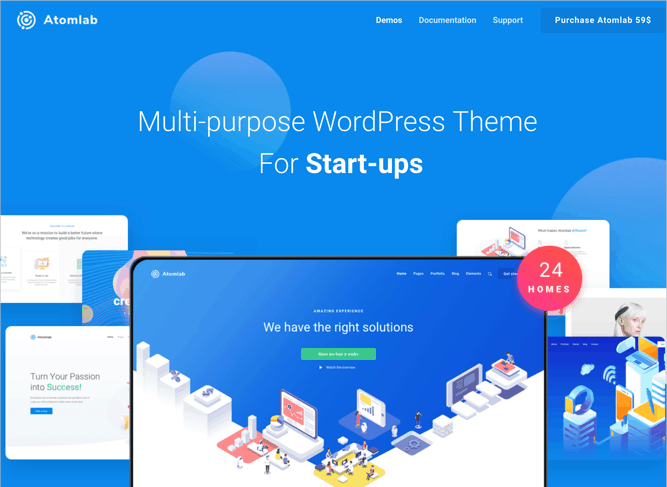 But you need to worry no more as you already have access to 35+ themes for you to choose from that are perfectly suited for startups. This way you have options you can choose from but not hundreds or thousands to filter. Now, your job is to choose the one that perfectly suits your business and your needs and add it to your site. Did we leave any good themes? Tell us below.